Watch the trilogy united to one movie. I wanted to do something in the vein of a Marvel-style action packed comic book using all of the pre-existing action footage and minimizing the many story-lines from the films to very specific moments that only serve to move the plot forward. 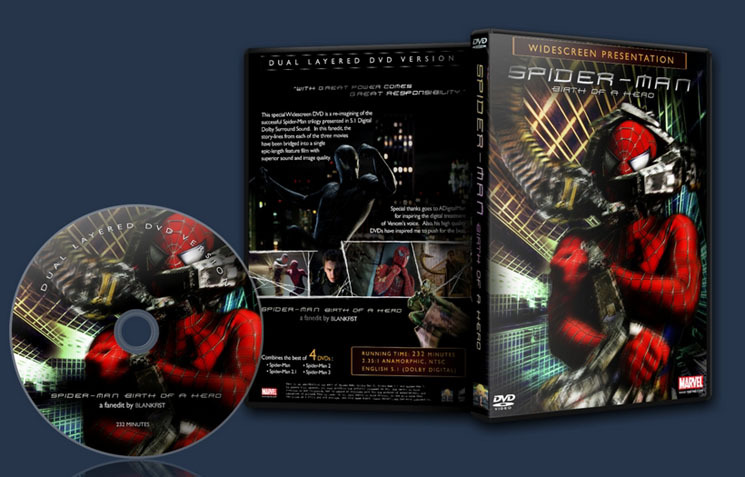 This is an action packed Spider-Man thrill ride meant for the true fanboys! Although I’m a huge fan of the Spider-Man trilogy, I wanted to do something in the vein of a Marvel-style action packed comic book using all of the preexisting action footage and minimizing the many story-lines from the films to very specific moments that only serve to move the plot forward. 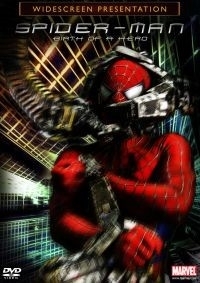 This is an action packed Spider-Man thrill ride meant for the true fanboys! 1 – Augmented original title sequence by adding “BIRTH OF A HERO” animation. 2 – Story-lines from movie 2 and 3 blended so to overlap where applicable. The origin is kept in tact, but the first movie is cut significantly where the story-line starts to focus too much on the Harry, MJ and Parker story arcs. 3 – Peter Parker cries a lot less. 4 – Mary Jane and Peter Parker’s story-line strengthened by removing redundant “get together/break up” scenes and “we can’t be together” scenes. 5 – Harry never experiences amnesia. 6 – Big props to ADigitalMan for his idea to treat Venom’s voice. I’ve also added a small effect to Venom’s voice, but it’s a touch subtler than ADM’s implementation. 7 – There’s no origin given for Green Goblin, instead it plays out as a slow reveal that Norman Osborne is the Goblin. The green mist is no longer a story element, though the green liquid is shown but once as Harry finds his father’s secret arsenal. 8 – Villain story-lines are intermingled – in fact, when Doc Oct robs the bank, Sandman robs the armored car about the same time. I had to do some creative splicing here to get this to work. If you look closely, you may be able to see where I rotoscoped out the pizza boxes in two Spidey swinging shots from SM2. 9 – For the Doc Oct action scenes, I opted for the SM2.1 extended fight sequences: they’re a bit more brutal than SM2 DVD’s version. 10 – No opening Voiceovers. Though, there is one Peter VO at the end. 11 – Parker no longer beats up Flash in high school. The main reason for me to remove this scene was because with Parker doing gravity defying flips in the air and knocking Flash twenty yards down the school hallway, it wouldn’t take much for one of the schoolmates to eventually figure him to be Spider-Man in the coming months. That scene never felt right to me. 12 – Removed Spider-Man losing his powers and the “Spider-Man No More” story-lines. I like them, and they work great in SM2, but they don’t fit in this retelling. 13 – Used SM2′s ending instead of SM3, because it was generally a better ending. And with how I tell the story of Parker and MJ, it really fits well with their budding love story. 14 – Macy Gray has been cut out of Unity Day as much as humanly possible. 15 – Goblin no longer wants to make a deal with Spider-Man. 16 – Most of the levity scenes have been taken out, which includes a lot of the J Jonah Jameson stuff in the Bugle. 17 – Timelines for MJ accepting John Jameson’s proposal have been shifted toward the end of the SM3 timeline, and it works well with the timing of Parker’s story to return the wedding ring to his Aunt May.